Alan Carrel purchased a house on Reinhard Avenue five years ago but before he did, his friends warned him about moving immediately east of Parsons Avenue. “The neighborhood was trashed”, he said. “Abandoned homes, absentee landlords, litter, drugs and prostitution were rampant.” Still, the street held a small-town appeal. A year later when he thought to host a neighborhood garden tour in the ‘hood, people thought he was crazy. “When I moved in there were no trees, no flowers and the neighbors didn’t know one another,” he said. In the mean time, Mr. Carrel started a garden club and block watch as a way to engage the neighbors. With the help of a few people a community newsletter was created and distributed throughout the area. Sponsorships and advertising from businesses in the area helped pay for it. A vacant lot next to his home seemed to be the perfect place for a neighborhood park, so Mr. Carrel and a group of neighbors adopted the space, cleaned it up and started creating a green space that would be a safe and enjoyable. Fast forward to 2008 and the efforts of Mr. Carrel and his neighbors have earned city-wide attention. The empty lot that has become Ganther’s Place Park is now being leased by the neighbors from the city for $50 a year. School children from nearby Heyl Elementary became involved and created art work for the park made from plastic bottle caps. Their 4th Annual Garden Tour this summer attracted over 350 guests and resulted in the sale of three homes. The neighborhood applied for and received a $10,000 “Think Green” Award by the City of Columbus which was made possible by the Waste Management Charitable Foundation and Keep America Beautiful. The money is being used to enhance the landscaping at the park as well as to add a year-round greenhouse. Ganther’s Place residents have also reached out to other neighborhoods on the east side of Parsons Avenue. “Some areas over here are not as bad as others, and we’ve encouraged these groups to do whatever they can now, because letting things go makes it much harder when the neighborhood falls as far as Ganther’s Place had”, says Mr. Carrel. Most recently Ganther’s Place attracted the attention of the Columbus Social Media Cafe (CSMC). This group of volunteers and Columbus enthusiasts met with the neighbors of Ganther’s Place and offered them a variety of interactive tools that could support their efforts. Before the two groups adjourned for the evening Ganther’s Place had created a blog as a tool for greater community dialogue, not only with one another, but with other neighborhood groups. Because Internet connectivity is limited in the area, other options were offered, such as a dial-in messaging system known as Utterz, as well as tips on how to create a Wi-Fi mesh network in their neighborhood and places where neighbors could learn how to build their own computers. “Here is a community group who already had an established means of improving the community. They were eager for assistance to take their community-minded efforts to the next level. As the members of the CSMC offered them ideas for using social media to connect, communicate, assist and collaborate, their faces lit up. They could network with other block watch groups to get and share ideas. They could report on problems in their neighborhood by mobile phone. They could breathe new life into an already wonderful garden tour by getting the word out. They could do the things they were already doing better, faster and more easily,” said Suzanne Wiles, a member of the Columbus Social Media Cafe. The neighborhood still has challenges but they’re being faced head-on through the sense of community that has been developed over the past five years. Landlords are being contacted about the upkeep of their buildings and the behaviors of their tenants. Neighbors meet twice a week to clean the alleys. Everyone who moves into the area is greeted by neighbors and given a copies of the community newsletter and informed about the “zero tolerance” attitude adopted by residents. One man’s ideas five years ago have created something truly wonderful in this small section of Columbus. Below is a picture of what things used to be like. Click this link to see how things have changed. I was out on my bicycle today. Just tooling around. Along the river, around campus, through Harrison West and along High Street in the Short North and downtown. And it never fails that this song begins to run through my head after I’ve been on the bike for a few hours. Beginning tomorrow, August 9th, a new blog will begin publishing the diaries of author George Orwell. Each post will be published on the site exactly 70 years from the date of its original entry in the author’s diary. The project will provide insight into the author’s life for four years, from 1938 to 1942. Entries in his diary precede the publication of his literary classic 1984, although the foundation of the book likely began to materialize when he was working as a propagandist for the BBC, supervising Indian broadcasts in 1941. 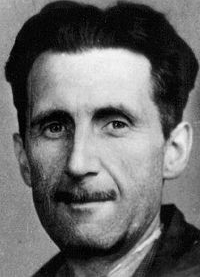 George Orwell was the pseudonym for Eric Blair who was born in British India in 1903. What if time were spherical rather than linear? Linear time requires that one thing happen before something else can begin. Spherical time allows all things to coexist simultaneously. With spherical time one only needs to find the shortest distance to any given point rather than waiting for one event to trigger another. Spherical time would better explain how it is that people enter and leave our lives, only to reappear later or at times to disappear completely, which is seldom the case. The term “crossing paths” indicates that two paths converge for a moment in time. But as is often the case, paths cross again. Straight lines, as time is currently portrayed, would not have the opportunity to cross twice unless of course they are constructed over a sphere. Think for a moment about something you’ve accomplished and let’s assume that the answer or result to which you’ve come has always existed. Essentially, the result or current expectation has always been there – its just been waiting to be discovered. “Its so obvious. I should have thought of that sooner”, is something we’ve all heard. I often venture to say that we limit our own lives because we’re constrained by the concept of linear time. If in fact time is a sphere, then we only need to see where we are, determine a destination, then look across the horizon and move across the sphere. Viewing time as spherical offers a unique look at what can happen when we shed the man-made constraints of what appears to be logic. I try to use the spherical model of time for problem solving just to see where it takes me.